Hello Folks! I have some exciting news to share. Today’s post comes to you by the one and only: The Sous Chef!! For the first time in the 11 months that this blog has existed he has cooked, photographed, and written a post!!! I have to let you in on a little secret. I don’t like Brussels Sprouts. Yes, it true…I am not a fan and I call them little fart balls. Sorry if I am offending any of you, just keeping it real here!! But he LOVES them!!! What I love is to see him experiment with them and I can’t begin to tell you how excited I was to see him use a Persian touch!!! Hello out there in internet-land, this be The Sous chef with an installment of Persianize your Food! But enough with the formalities lets get on with today’s recipe. In the world of children, and some adults, there is no worse curse than being fed the dreaded Brussels sprouts (Lord Vader music playing in the background). This little under-appreciated cabbage is usually served overcooked, under-flavored, and drenched in either butter or cheese to unsuspecting children the world over. Is it no wonder that so many come to despise this vegetable? By some unknown force, be it ignorance or stubbornness, I truly enjoy them even though I was introduced to Brussels sprouts by my parents in the above mentioned way. Therefore, today we will be describing a way in which to prepare the sprouts so they are both flavorful, appetizing, and with a Persian flare (Superman music playing in the background). 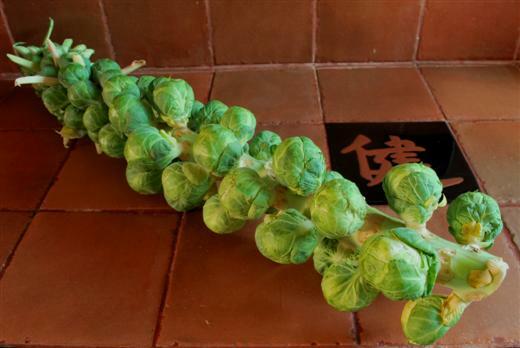 When Brussels sprouts are in season they can be found at some stores still on the stalk as in the picture above, and in this condition they are usually cheaper than buying them already separated from the stalk. I would only suggest buying them this way if you are going to be eating quite a few of them over the next week or so, as this stalk probably had over three pounds of Brussels sprouts on it. Before I get to ahead of myself let’s have a look at the ingredients list, shall we? 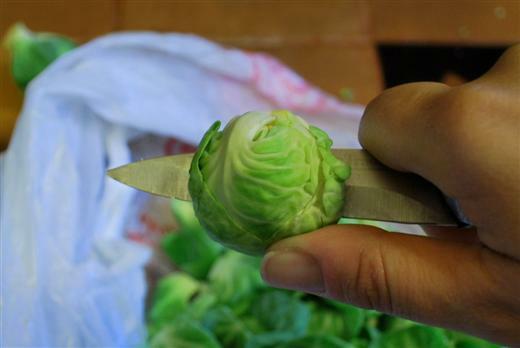 After removing the Brussels sprouts from the stalk trim the ends, remove any bad or damaged leaves, and rinse. Cut in half, stalk end to leafy end. Place in steaming basket, and then into a pot. Add enough water to just touch the bottom of the basket (the amount of water will vary depending on the pot, so this is the best measurement to use). 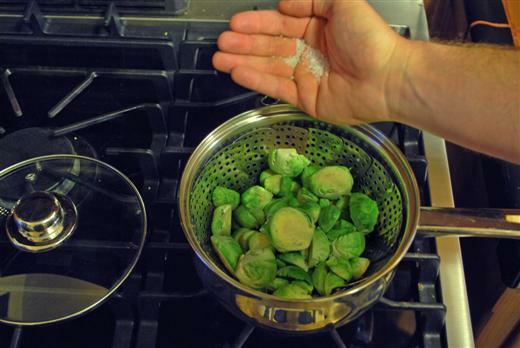 Bring the water to a boil, sprinkle salt on Brussels sprouts, and then cover. Cooking time is 10 minutes. 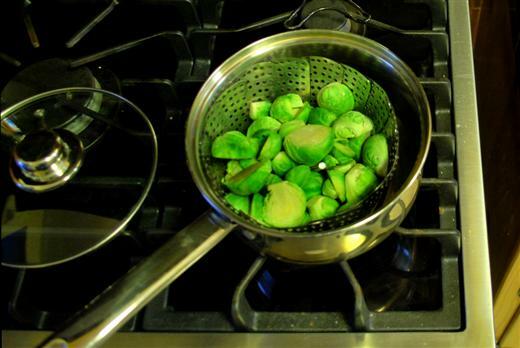 Once the Brussels sprouts are cooked remove them from the pan. Drain the water from the pan and wipe it clean. 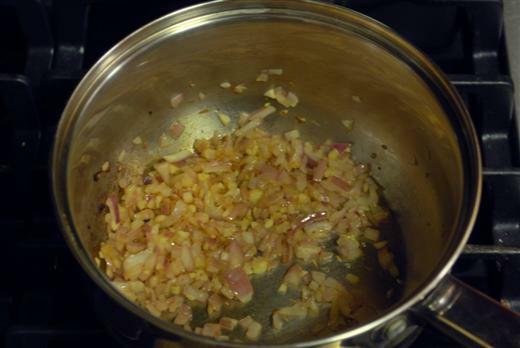 While the brussel sprouts are cooking dice your onion, and finely mince your garlic. You can also get your pistachios ready as I have. 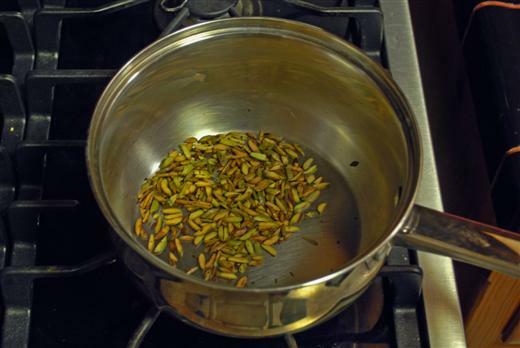 Add the pistachios to the dry pan over medium heat and keep stirring until the pistachios are nicely toasted, be careful and pay attention as they will burn really quickly if you don’t keep them moving. Once they are turning a light brown remove them from the pan and set aside, and once again wipe the pan clean. 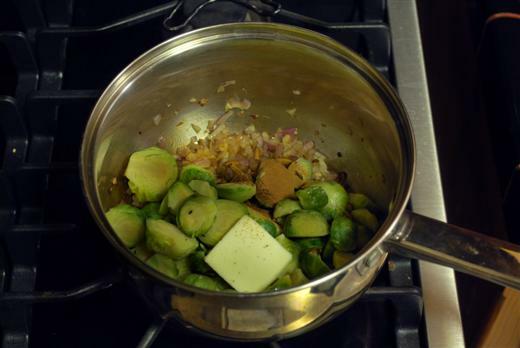 While the pan is still hot add the other ingredients: Brussels sprouts, pistachios, butter, cinnamon, and cloves. 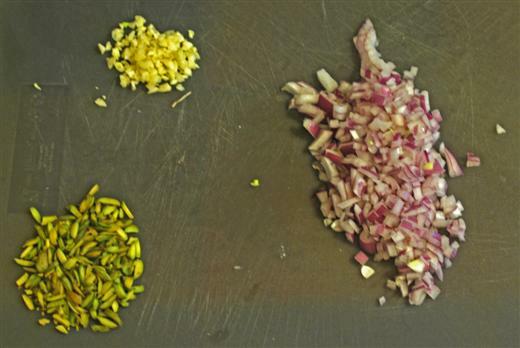 Stir vigorously until butter is melted and Brussels sprouts are coated in spices and pistachios. 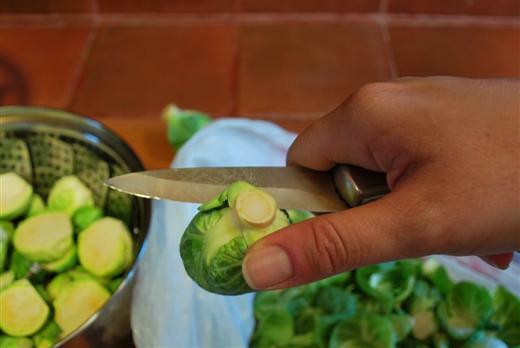 Cover and let sit for 3-5 minutes, this lets the brussel sprouts finish cooking and allows the flavors to get a chance to incorporate together. There you go, a simple one-pot side dish that is quick, flavorful, and good for you. I hope you enjoy it and can share it with someone that was, or is, traumatized as a child by the overcooked and under-flavored version of brussel sprouts. So until the next installment of Persianize your Food! enjoy your day, or middle of the night, out there in internet-land. Yum! I love brussel sprouts. Thanks for sharing this wonderful recipe. I adore Brussels sprouts. Buying them on the stalk and picking them off is such fun. Great post, Sous! I stumbled across your blog. Awesome stuff. I’m African American but have been hanging around Persians/Iranians for years and am familiar with the cuisines. Tadik/tadique is a regular rice dish in our family. Persian food has become for us another form of “comfort” food. Thank you for such great photos and recipes. Thank you for your kind words Aphalos! I am so happy to hear that you consider Persian food “comfort” food. It’s music to my ears!! I’m glad to hear about your enjoyment of Brussels sprouts. I hope this recipe was helpful. Once again I would like to reiterate : My name is not Sue. 😉 Thanks for the comment. I really liked this brussels sprouts recipe, it was a nice way to liven them up & was very simple to make. I didn’t have any pistachios so I subbed flaked almonds. I served it with rice & a recipe very loosely inspired by your “Mitra’s Sunshine Chicken” recipe (mine was more like a stew, with added sweet potatoes, carrots & extra herbs & spices… and I used Quorn – vegetarian chicken substitute). 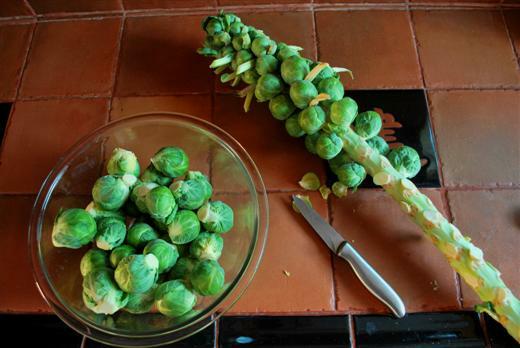 I think sprouts like these would go very well with non-Persian foods too, like traditional British roast dinners and stews (it would actually work well with christmas dinner! ), or perhaps even with a curry. My daughter isn’t a big fan of sprouts (not to the extent that she refuses to eat them, but she usually eats them grudgingly) and although this recipe didn’t completely change her attitude she did admit that they were “nicer than they usually are”, and didn’t complain once! Saskia, I am so glad to hear that you have tried this recipe and liked it! Woohoo! 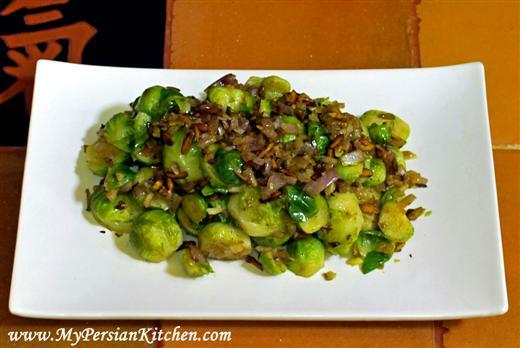 what is the persian word for brussel sprouts? ?